VW Golf production in Wolfsburg was hit by parts shortages. HAMBURG -- Volkswagen said production of cars at its German plants should be back to normal by next Monday after it resolved a dispute with parts suppliers over contract terms. VW and two suppliers on Tuesday resolved the dispute affecting 28,000 workers at six of VW's 10 German factories, a day after the automaker halted production of Golf and Passat models, as well as assembly of engines, gearboxes and emissions systems. 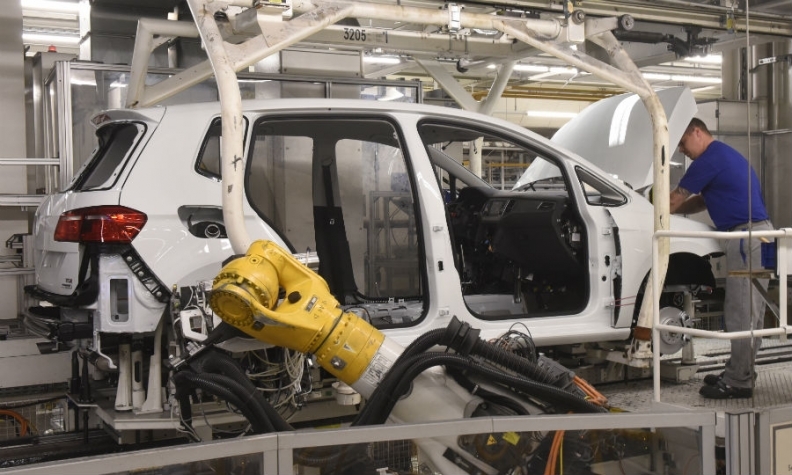 Component plants in Kassel, Salzgitter and Brunswick will accelerate production over the coming days to reach normal output levels by the start of next week, VW said on Wednesday. The dispute with suppliers Car Trim and ES Automobilguss had stopped deliveries of seat covers and cast iron parts for gearboxes. The suppliers were seeking 58 million euros ($65 million) of compensation for advance payments they made on a development contract that VW cancelled without notice, two sources familiar with the matter told Reuters. VW had refused to pay the sum. The new deal will see the suppliers, both part of Prevent group, work with VW for at least another six years. VW will also be able to source up to 20 percent of cast iron parts from another supplier over that time, the sources said. VW also agreed to pay 13 million euros ($14.7 million) compensation, the Sueddeutsche Zeitung reported.